What makes a great teacher--a list to live by! 1. Interpersonal skills trump professional skills. Students like the teacher, like the class, and like school. This happens because they know the teacher values them and what matters to them. They can tell this because they are treated with kindness and respect. 2. Give students a job and let them do it. The teacher has faith in his students, respects their expertise, and lets them do their assignments without interference. Although he is there to help when they need it, students have the room to try new things, and can fail without being a failure. This makes the success students' success. 3. Be open and collaborative, but step in when needed. The teacher values opinions and ideas expressed by students. Discussion and disagreement are valued and used in the process of learning. However, a level of control is expected and maintained. The teacher talks to students, in the cafeteria, the hallway, on the way to the bus, between classes, and all of the non-class times. 5. Keep a sense of perspective. The teacher realizes school is about the students. Academics are important, but not the most important thing. The "test" is important, but not the most important thing. 6. Finally, be a decent human being. A single word to describe the teacher is "decent." The teacher doesn't lose his temper, put down a student, or treat anyone disrespectfully. His sense of humor is never far from the surface. He rarely accepts credit, but credits others for the school's wins. He is honestly humble and self-deprecating. Doug Johnson on the Blue Skunk Blog discussed what made a good boss. This list has been adapted from his comments about a great boss. I thought his post was a remarkable tribute to someone that achieved at the highest level. With this in mind, I thought about how this related to being a good classroom teacher. Now, I am not claiming to do these things--I am just thinking about goals for the new year (You don't suppose students will have to set goals, do you?) Wish me luck as I formulate my goals based on this list. As 2008 comes to a close, this is the Top 10 posts of 2008 on The Reading Workshop blog. Everyone loves the beach, and the favorite post of 2008 had to do with bikinis and highlighting. Questioning courage was popular as discussed in the post, Courage, Do You Have It? Two posts discussing the trends in reading and writing by teens were popular in Teen Writing, ru lol? and Is Surfing the Net Reading? Everyone seemed to wonder, Do We Really Need Books? Knowing What Doesn't Matter when you are reading was important to many readers. Lots of people seemed to want to be Smarter Than a Seventh Grader, and read about how this helped students prepare for the Ohio Achievement Test. Many students seemed to want to Be on the Road to Smarter. The Where Am I's? were a favorite of last year's class with Where Am I #5 having 107 comments until Josh and Caleb nailed it down. I Hate Reading and I Don't Hate Reading, two posts that discussed a student's struggle with how he feels about reading gathered a lot of interest. Thanks to Alltop, which lists top educational news and blogs for placing The Reading Workshop on their site in October of 2008. Joanne Jacobs also shared posts from the blog. Hopefully everyone found at least one post that made it worth the time visiting . Thank you for reading! I was reading Let Me Tell You a Story: A Lifetime in the Game, written by Red Auerbach. Red won eight straight National Basketball Association championships with the Boston Celtics. He was named NBA Coach of the Year in 1965, and in 1968, was elected into the NBA Hall of Fame. As General Manager, Red Auerbach teams won seven more championships. He is credited today as being the main factor in building the popularity of the NBA. Red had one rule when it came to team rules: he didn't have any rules. If you make rules, set curfews, things like that, then you put yourself in a position where one guy screwing up can hurt the whole team. I never had an ironclad rule on anything because I wanted flexibility. If I had ironclad rules, then I had to enforce them equally. That's not always the best thing for the team. I started thinking about how this relates to the classroom. A strict, law and order based classroom might work for some teachers and students, but for the majority it fits like a shirt collar that is too tight. It starts out causing a little irritation. As the day goes on, it begins to chafe more and more. By the end of the day, little else matters but to get free of the irritation and get on something more comfortable. Or, in the case of the classroom, get to some place more comfortable. He never made any pretensions about treating players the same. In fact, he treated everybody very differently. Basically, Red treats people as they perceive themselves. What he did best was to create a forum, but one where individuals wouldn't be confined by the system. And he understood the chemistry of a team. People tend to think teamwork is some mysterious force. It isn't. It can, really, be manufactured, and he knew how to do that, to serve each player's needs. If you were to ask, I am sure all students would say they want to be treated fairly. But, this brings up the often argued point that being treated fair is not the same as being treated equal. No one could ever argue for treating students unfairly, but there are a lot of reasons for not treating all students the same. This would only work if all students were the same. If students follow these two rules, they will be successful. Every student I know of that followed these rules was successful. I think Red had it right--treat every player student as an individual, and help them find the way to their own success. Collin came up to me and said he needed a book to read over break. I started to recommend a book, but then I caught myself. Collin reads a book every day to two. Hhhhhmmmm, what's a teacher to do? I have been reading Gordan Korman's Chasing the Falconers from the On the Run series aloud to his class. I am almost finished with the first book. I started grabbing books off of the shelf. He left the room carrying all six books in the series. I looked up and Christian was watching us. He came up and said, "Mr. McGuire, can you recommend a book for the break?" In just a second, Christian headed back to his seat with the On the Run series in tow. He already had a Tucket book by Paulsen, but he is almost finished with that series. While all this was going on, Rachael headed out to the book room. As she packed up to leave class, I checked out the stack of books she had picked up. She was all set with books from Joan Lowery Nixon. Kyndrah, Bree, Peyton, Kara, and a couple of others are into the latest vampire craze and are reading the Twilight series. Kayla and Jolene are the latest checking out the Diary of a Wimpy Kid. I have Book 3, The Last Straw ordered and will get it when it is released on January 13. All of these are great choices! BUT, the most important thing--just read! What are you going to read over the holiday break? Special thanks to Mrs. Bower for the reminder to load up on books before break! I read aloud the first chapter of Woodsong today. Gary Paulsen describes a scene running a team of sled dogs. He talks about the beauty of a sparkling sunny, but cold day. His dog team was working in tandem and everything was wonderful. Then a doe busts over his lead dog, and onto a mostly frozen lake as she was being chased by a pack of coyotes. The scene turns from one of unbelievable beauty to unbelievable horror. And this led to Paulson questioning his thoughts and ideas about nature. 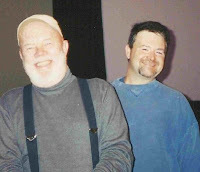 Later, as I thought about how students responded to this story, it caused me to reminisce about meeting Gary Paulsen. Much in the same manner as the first chapter of Woodsong, he comes across first as this kindly, little old man. Then as he begins to tell his stories, you realize that maybe you don't quite know him. As each story unfolds, you begin to realize that the more you listen, the less you understand. Obviously the tales from his childhood that forced a premature self-reliance also impacted him in other ways. His love of nature, at first as an escape, and later for the wonderment, always shows through. Talking to him though, quickly forces a reevaluation of all of the preconceived notions based on reading blurbs and enjoying his books. This is a rough, tough, crude, man's man. This is someone who can stand tall in any crowd, but doesn't care. He has lived his life based on his decisions. He doesn't write of the horror he witnessed that day by the lake to amaze his audience. He does so to share his feelings and help the reader understand his journeys. I am sure his goal is to write in a way that will cause the reader to think and reevaluate what he thinks he knows. And hopefully the students today did just that. Several students said they didn't like this book as a read aloud. They wanted me to switch to a happier book. But I am going to read some more. At least then, maybe they will understand how a master writer shocked them, to make them think and make them learn. Grades in Reading Workshop are earned based on students' work. Most assignments are graded using a rubric scoring work with 1 - 4. This tanslates into 4=A, 3=B, 2=C, and 1=D. As long as students make an effort to complete their work, they do not recieve an F.
However, doing extra work can significantly raise students' grades. This rewards those students that take the time, and make the effort to earn higher grades. There are several ways students can improve both by doing extra reading and extra writing. As a teacher, I reward the students that make the most effort. Although grades are not entirely tied to how hard a student works, poor grades are reflective of a lack of work ethic. The grade is based solely on time read. Students online journal is scored using a rubric, but by writing more, they can drastically improve their score. The more detail in each entry, the more likely journals are to earn an A. Time in the classroom to write in journals is limited to about ten minutes. Students that are willing to spend additional time can obviously have more detailed entries. By having the journals online, students can work on journals anywhere they have Internet access, including during library and study hall classes. Commenting on the blog earns extra credit. Several students raise their grade by at least one letter every nine weeks, by commenting frequently. This is an excellent trade-off for me, because students read posts, think about them, and then write responses. Consistenly reading the blog also gives students a better understanding of Reading Workshop goals and expectations. There is no excuse for poor grades in Reading Workshop. If students don't like their grades, all they need to do is read more and write more. 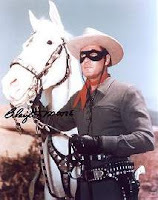 Da dada da da da da da, the Lone Ranger is on his way. He will solve all problems. He will rescue poor grades. He will ride in on a white Accord and save the day. No chance of failure here. Just raise your hand and he will come to your rescue. Wait a minute. I've missed more than 9,000 shots in my career. I've lost almost 300 games. 26 times I've been trusted to take the game winning shot and missed. I've failed over and over and over again in my life and that is why I succeed. So what is reasonable to expect from a student when they walk into Reading Workshop? Should I expect failure? Or better yet, demand it? Shouldn't students have the right to fail? Shouldn't students have the opportunity to fail? If I rush in as soon as a student struggles, it seems like there is no chance of failure. This means a there is a limited chance to succeed. So often in schools today, we will go to absolutely any means to prevent failure. If students even struggle, someone is demanding a parachute to immediately stop the decent. Many educators see our job as rescuers. Failure is seen as a terrible thing that must be avoided at any cost. Perhaps we should redefine our role. Our job is not preventative maintenance. At the first sign of a break-down, we should not be coming to the rescue. There is no need to charge in at the first sign of a raised hand and save our students from struggling. Better yet, let them work through a problem, and figure out how to succeed. 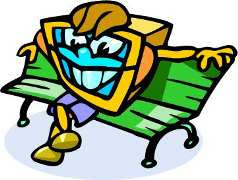 Recently I was involved in a conversation about the role of blogs and the value of blogging in our district. As the use of blogs and wikis expand throughout education, many questions are being asked. The use of Web 2.0 tools in schools is a known entity to some, but blogs are still of questionable value, or just not understood by many people. I started thinking about all the benefits that I see. Parents, your child's homework assignment for tonight includes you. Students have been working hard on their online journals. Tonight is their chance to share their work with you. Hopefully you will enjoy this opportunity to see what your child has been doing in Reading Workshop. The online journal is used daily for students to write on topics about the fictional books they are reading in language arts class. A lot of emphasis is placed on supporting their thoughts, ideas, and opinions with specific details from the book. Keep in mind though, they only have 5 -10 minutes each day for this writing task. Please look over your child's online journal, answer questions on the sheet, and score the journal using the Online Journal Rubric. Please feel free to look at other students' journals also. This will give you a way to gauge the overall quality that I am looking for in their journals. A couple of excellent examples are Sarah's journal, Lily's journal, and Makayla's journal. Take a minute and leave a positive comment in any of the journals if you see something you like. I am sure the students would really appreciate it. Do We Really Need Books? Should schools still be buying books? Is reading something online on a computer, or on a reader the same as sitting down with a book? Instead of replacing books in the book room, should we instead try to find online editions or invest in Amazon Kindle? Or is there something about holding a book in our hands that we should never give up? Are books about to be something of the past? Should I give up my newspaper and read the news online? Instead of the sports page, should I visit NBA.com Instead of reading a magazine, should I just visit the website of T.H.E. Journal? Adrien Sannier in his article Context to Core in Campus Technology says stop air conditioning the books! All the books in the world are already digitized! Change it (library) into a gathering place; a digital commons. At my house, I have a spot by the window, with a lamp on the ledge, where you can often find me reading. After school it is usually a newspaper. Then I usually check out a magazine. 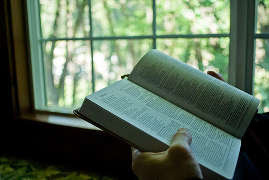 Later in the evening, I often sit there reading a book--sometime fiction, sometimes nonfiction. If I am at home, more times than not, you can find me here reading. Do I want to give this up? Not in this lifetime. What do you think? Should we give up books and go totally online? Or is there something special about books that we need to save and appreciate? Will there ever be a day with no books? Who are these kids? It used to be we worried about too much Sesame Street and Barney, or other TV time, but those days are gone. Today, we worry about another type of screen time. Kids are either texting, IM'ing (instant messaging), on Facebook, or possibly even doing a Web 2.0 assignment for school. Should we be concerned? Is all of this time staring into a screen of one kind or another harmful to kids? Many educators are concerned about the adverse affects on students' writing. They feel that the slang, or casual language used extensively in texting and IM'ing will have long term detrimental affects on students' writing. Most seem to ignore the fact that kids today are writing constantly. In fact, putting thoughts into written words is part of the natural lives of kids today. Anyone who cannot share their thoughts through texting is at risk of becoming a social outcast. Another concern is the constant focus on a screen. Although this has shown to have some merit, this has basically replaced other forms of entertainment such as hours spent watching TV. At least many of the hours spent today are somewhat interactive. Another worry, especially at the secondary and collegiate level is how students spend class time texting instead of focusing on the lesson being taught. However, forward thinking instructors have begun to use this to their advantage by engaging students in real-time dialogue and assessment. In many classes today, students are participating in online learning, web-based collaborative projects, and various other computer uses throughout their school day. Often students are much more motivated in class by the use of video and interactive Smart Boards. Obviously, the screenagers of today have lifestyles, both in and out of the class that are much different than the traditional classes. Many educators are concerned about the long-term affects of these changes. Some of us though, are celebrating the advancement of education. Our goal is to open doors and encourage students to push forward using every tool available for a more interesting and challenging learning environment. If you qualify age-wise, go for it. Become a Screenager! Recently students were surveyed about their feelings regarding computer use in the classroom. As we continue to find more and more ways to integrate technology in Reading Workshop, I thought it would be interesting to see students' viewpoints. 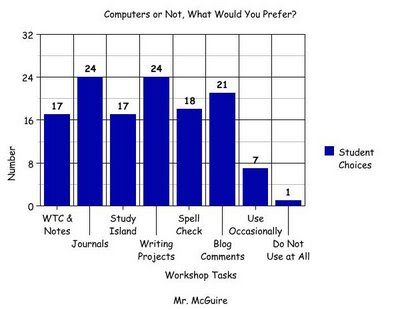 I found it interesting that overwhelmingly, students prefer to use computers for language arts tasks. The fact that only one student would prefer to not use them at all is amazing. I am not sure that you could poll students about any topic and find such a consensus. As the year progresses, we will be doing even more innovative activities, which would push the data even farther in favor of the use of technology in the classroom. Stay tuned, videos are on the way! They came from 35 states. They came from 16 countries. Sixteen visitors were from Texas. Twelve were from New York. Sixty five visits was the most by any one person. Fifty nine was the second most times visited. Two Hundred Sixty Nine started out on The Reading Workshop home page. Twenty-two had questions about how to do Reading Workshop. Sixteen had questions about Study Island. Six wondered about the book Freak the Mighty. Fifteen had question about listening to music as you work. Twelve wanted information about the affect of texting on students' writing. Thirteen visited for longer than an hour. Thirty six wanted to know about Rambunctious Reading. Ninety two percent that used a search engine, used Google. Sixty seven percent are first time visitors. One Hundred Eighty are using the newest version of Firefox. Seventeen came from the Laurelville Elementary website. Twelve came from Alltop which lists education news and headlines from across the web. Three came from Joann Jacobs educational blog highlights and links. So if you're like me and find yourself wondering, who cares about The Reading Workshop at Laurelville, the answer is a lot of people, from a lot of places, for a lot of different reasons. For all that take the time to visit the blog, thank you!. 1. She always says "we." I haven't heard her say "I" one time. 2. When she talks about Laurelville, she always talks about our "school family." 3. She always listens first, and talks second. 4. I have heard her say, "how will it help the students," over and over. 5. She says, "no excuses." She expects every student to succeed. 6. She looks people in the eye when she talks to them. 7. Our school is a happy place this year, reflecting her upbeat attitude. 8. She is all over the school, stopping in rooms just to see what is going on. 9. She smiles at students and says hello. 10. Students smile at her, and say hello. 16. She has high expectations for herself, the teachers, and the students. 17. We had a tree lighting. The staff brought in cookies and every student got one. We went out to the tree and Ms. Fraley talked about our Laurelville family. We sang "We Wish You a Merry Christmas." It was almost perfect, as the snow flurries fell on us, and we were all proud to be part of Laurelville Elementary. 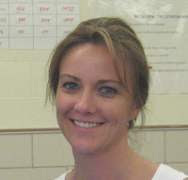 I like Mrs. Scott because she is so friendly when you walk up to her. Also if she has a concern about something she will walk up to you very kindly and ask you what is happening. When we are doing something she will be really quiet so she will not disturb us when we are working on a paper. She always says hi to you when you are walking along. If I had to use one word to describe her it would be approachable and that's cool. And usually they do it without help from me. To become workshop stars by the end of year. 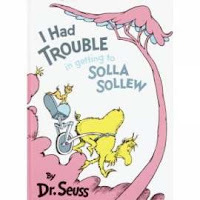 Today's read aloud was I Had Trouble in Getting to Solla Sollew. Students had been reading rambunctiously to an excerpt from the book, so today I read aloud the book and modeled rambunctious reading. As a follow-up assignment, in students' online journal, they wrote a response to the prompt--Tell the "So What?" What is the Point of the Story? Here are examples of their responses. I think that in the book Solla Sollew the point is you will get trouble in life and you will not like it, but you can't run from it. You have to face it. Even if you don't think it could get any worse it will get better soon or later. In the book the little guy learns that you will have trouble, you will think that the grass is greener somewhere else,but you can't run all your life. One day you have to stick up in life and grab a bat!! Your life will get better soon. So he went back to Valley of Vong with a bat to stop all his trouble (have fun with that)! The book I Had Trouble getting to Solla Sollew is a really good. I think that the meaning of this book is if you have troubles don't let it mess with you, just do something about. Like what the main character did. At the end of the book, he went back to the Vally Of Vung That's why I think that the meaning of the book is it don't let any thing bother you. You should do something about it. then you can be left alone and nobody would bother you. Another meaning of the book might be don't do something so big and then go back to that same thing. Like what the guy in the book did. He went on this big trip to the city where there are no troubles. Then he went right back to the Vally Of Vung. This time though he was prepared. So don't try running away from the troubles, just fight back and be prepared for what ever happens. Then nothing or nobody can mess with you and ruin your day. I enjoyed the book and I'm sure I wasn't the only one who enjoyed it. This story was written by Dr. Seuss. The So What of the story is also the main point of the story. (I think!) So the main point of this story is to not try and hide from trouble, just deal with it.the more you try to hide from it, the more you get! 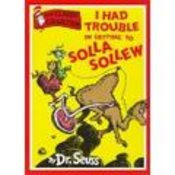 I think the So What of the story I Had Trouble In Solla Sollew is that you will always have trouble where you go and you should not run away from your problems. And facing trouble is something that they know. The road to stardom, they're on their way. Getting good grades should be child's play! You might say that I had rhyming and Dr. Seuss on the brain as I posted today. Stop the Bus, I Want to Go to School! I saw the flashing lights ahead, and eased to a stop. The bus stopped but no one was there. Then it took off. As I passed by, I looked over and saw a student chasing after it, waving her hands wildly. I traveled on down the road towards my school and watched in my rear-view mirror as the bus was chased out of sight by a student who wanted to go to school. As we return to school, after a five day break for Thanksgiving, I thought, "what a sight." 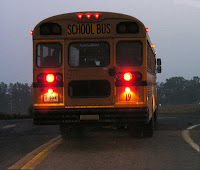 I felt sorry for the student, and I was sure glad to see how badly she wanted to get on the bus and get back to school. Any kid that tried that hard to get on the bus after a break is bound to be a hard worker.